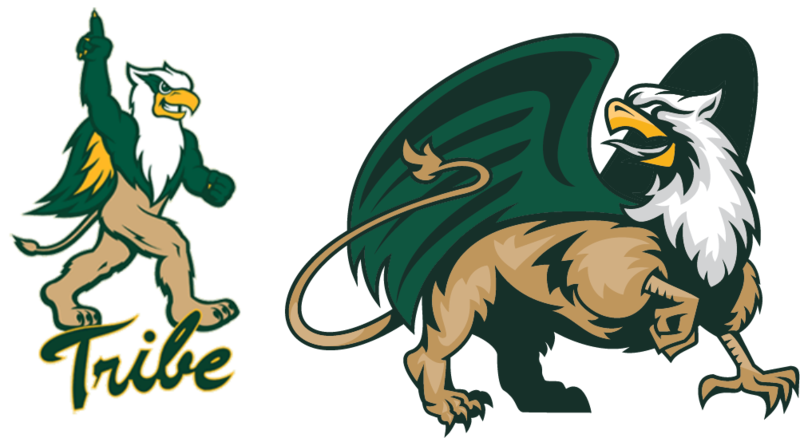 Last week, William & Mary made headlines when it completely overhauled the school’s athletics logos. Local newspaper outlets, local news stations, and even some national outlets were quick to cover the story. And in today’s technologically friendly world, fan reaction on social media was immediate. There were all kinds of folks chiming in, some with positive comments, and many with negative comments. We get it — change is hard, especially for an historic school like William & Mary. But we at the Blog commend W&M Athletics Director Samantha Huge for addressing a serious branding issue for the “Tribe.” Head Basketball Coach Tony Shaver put it best when he said, “People in California or Wisconsin or Michigan may not know what Tribe is, but they know William & Mary.” In our opinion, whether or not you agree with how it was done, the new logos’ greater incorporation of “W&M” and “William & Mary” is a step in the right direction. And maybe, just maybe, with time — these logos will grow on you. All we ask is that you give them a shot this year. While the logo works on some levels, I dont believe it helps solve the primary problem that was identified. Brand recognition of “Tribe” by those outside of the region, I agree, was poor. The name William and Mary is known. However, the logo fails to address this, by muddying the simple rigid W and M with a blurred and blobby ampersand. The ampersand is revered by W&M alums, but blending it into the letters makes it difficult to decipher and comes across either as an illegible character or perhaps as W-E-M (William E Morris U? ), which does not help our cause. Understandably, shrinking the ampersand in the most recent failed logo attempt also looked terrible. Perhaps alums should face up to the fact that the ampersand in the primary logo should be removed, as it was with the old block WM with feather. Furthermore, usage of simple block WILLIAM MARY, as on last years basketball jersey is the ultimate clarifier. I am an unapologetic supporter of the feathers, and the NCAA has my undying emnity because of this issue. When President Reveley announced “Get me the Griffin”, an opportunity was presented to reunite “W&M” with the feathers. With the presentation of the new full primary mark logo, a whole head and upper torso of eagle’s feathers was reunited with “W&M”, and I couldn’t be more pleased. While the school’s FAQ sheet mentions why the “feathers” weren’t brought back, the reality is just the opposite. The feathers have been brought back in an unobjectionable way. To the NCAA, go pound sand! W&M has prevailed- Tribe and feathers endure! To AD Huge, thank you for bringing the feathers back to us. You have my undying gratitude. Relative to the simple primary mark (with and without stroke), my first reaction was not positive. However, I have seen the “new” basketball court, and I have seen a new polo shirt (white lettering on a green shirt), and I must say, my opinion has changed. I think everyone is going to be pleasantly surprised. So, put me in the “great job” camp. Go Tribe! I’ve been adorning William & Mary Tribe gear literally as long as I’ve been alive. My Dad, W&M class of 1979, put my in a W&M onesie just hours after my birth, and the green and gold have been apart of my blood and wardrobe ever since. No matter the numerous iterations of W&M logos, with feathers and without, W&M gold and spirit gold, I’ve always worn my green and gold with pride whether playing catch with my Dad as a kid on the Zable field after a game, walking around the Sunken Gardens as a student myself, or in the stands expectantly cheering for the Tribe men’s basketball team to finally bang that door down and make it to the NCAA Tournament. 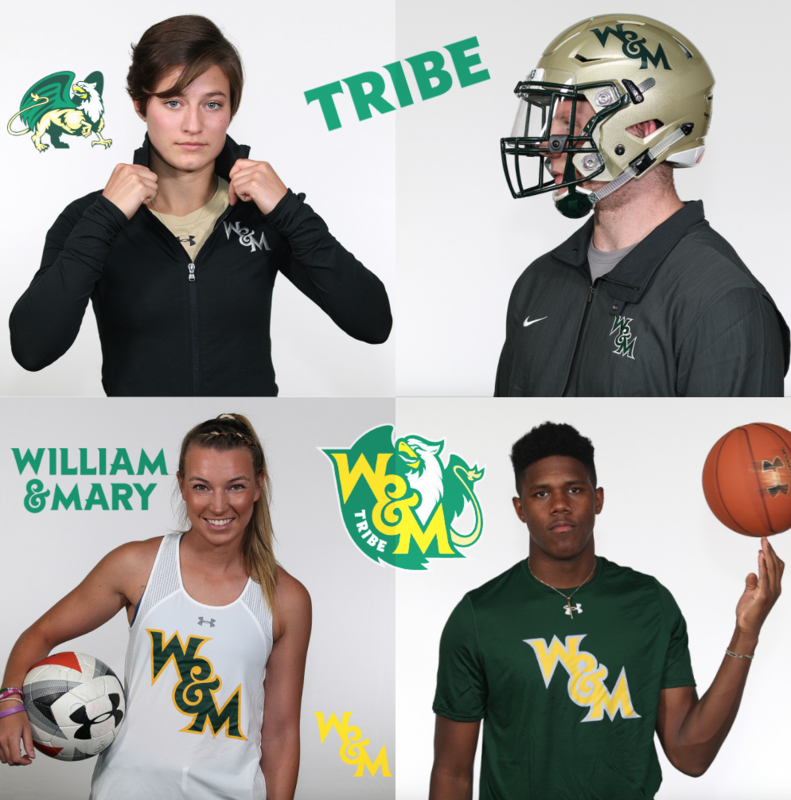 The logo is not what W&M is about, the Tribe is what W&M is about, the family. One Tribe, One Family now and always, feathers or no feathers. Is the new logo or branding that was rolled out this week by AD Huge perfect? No, not at all. Does the new branding represent progress though? Absolutely yes, and that’s the most important point of all for me. While we proud members of the W&M community continually celebrate and are captivated by our amazing history, we can’t be held captive by it. The world is moving forward around us and not backward, looking to the future instead of being stuck in the past, and for the first time that I can ever remember in my lifetime of proudly adorning W&M attire, our athletics department, led by the innovative and bold, AD Huge, is doing the same. For that I am both extremely hopeful and grateful. While I am not yet sold on the product (though it is growing on me), I am sold on the process. A process for the bold and the brave. A process that pushes us out of our comfort zone to go places we’ve never gone before and achieving things we’ve never done before. We can’t truly achieve what we want to achieve unless we are willing to fail. Time will tell whether this new brand, product, will succeed or fail, but I truly believe that regardless of if it does or not, the process will succeed in achieving greater levels of excellence then we have ever seen before, and besides, whether this new logo and branding succeeds or fails, we will still be the Tribe. One Tribe, One Family, and no one and nothing can ever take that special community away from us, and that perhaps is our greatest success of all. It’s transition time for the Tribe. Dr. Rowe moved onto ancient campus this month, and Samantha Huge has already made a name for herself as the proactive leader our athletic department badly needed when she arrived in Williamsburg. And, like it or not, there’s no ignoring the Tribe’s move to Under Armour, as seen on almost all of the Campus Shop gear and team uniforms. The new branding set is the school’s latest and most recognizable move towards revolutionizing the Tribe. Unlike the change in leadership at William & Mary, branding and logos seem to change with regularity. And why not? Everyone else seems to do it every few years, and having access to new-look gear is exciting for fans, students, and athletes. To much of the Tribe’s chagrin, as seen all over social media, the new logos are a miss. The tricked-out font looks like it was taken off of a middle school poster presentation, and the “gold” is very clearly not gold. If it doesn’t look good on a football helmet, how will it look 1000x bigger at center court in Kaplan? The only place I’ve seen the new “W&M” logo on a product I would purchase is on the black Nike rain jacket… and who knows how much Nike apparel the school plans to sell in the future? The project is not for lack of effort—the new branding answers the calls of those asking for a tougher looking griffin, which I believe it does well. As fans it’s incredibly easy to complain and point fingers at the talking heads in charge. But this issue may be more complex beneath the surface. Did the athletic department feel pressured to change things up? Was timing a factor? To what extent did Under Armour have an influence? When I first saw the Instagram release, my kneejerk reaction was that things were better with the “Tribe” lettering from a couple years ago. Aside from a potential lack of reference to the name “William and Mary,” that logo was perfect in a sense. Simple yet bold, it clearly presented an encompassing word that has meant so much to our community. On move-in day, new students hear a constant buzz of “welcome to the Tribe,” “one Tribe,” and “Tribe choices.” The new branding initiative is a stark removal from the “Tribe” we’ve grown to know and love, and it feels like a rushed, impersonal shot at keeping up with our peers. I like the new logo. I think it shows creativity and progress. I’ve been a Tribe fan before we had Tribe and were the Indians. Yes, I go back to the early 70s for my support. 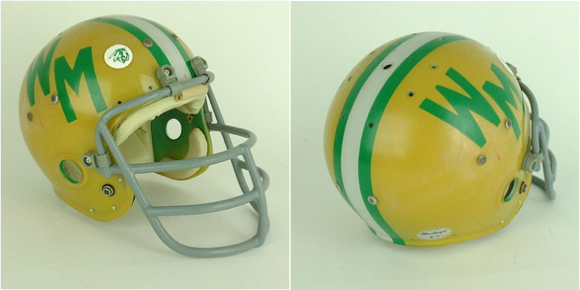 I grew up in the Williamsburg area and played a varsity sport at William and Mary in the 80s. I’m excited about the changes since Samantha Huge came on board over a year ago. I have confidence that this logo and a more prominent Griffin will represent the college well for years to come. That said…..I wish they would have put 1693 on the logo somehow. Great college logos (e.g., Texas, Miami, Clemson, Virginia Tech) have a few common elements. They’re simple, timeless, and versatile. In addition to meeting these criteria, Samantha Huge and the Athletics Office faced the challenge of pitching yet another redesign to William and Mary’s keen, outspoken, and hidebound constituency. Did they succeed? Timeless? This is hard to judge. The sleek contour and wingtip serifs on the lettering strike me as slightly gimmicky. But fashions turn and return like the seasons, and old fads may live to become chic again. The case for timelessness will improve the longer this logo survives. Nothing waters down a brand like annual reinvention. Versatile? The new logo looks much better in certain colors and contexts than it does in others. For example, when the primary color is green with a gold outline on a white field, the lines stand in powerful, legible relief. However, when the primary color is gold with a white outline on a green field, the lines bleed together illegibly. This suggests a lack of versatility. Case-specific considerations: Mercifully, the “griffin” appears only in secondary renderings. The griffin and its attendant paraphernalia represent an unwelcome intrusion of nerd fandom into the higher realms of athletic competition. However, my primary concern with this logo is that we as fans simply be permitted to fall in love with it. The school is 325 years old but leaves a wake of junked logos, word marks, color palates, nicknames, and mascots twice as long. Let’s put some mileage on this one before we lease another. ← Tribe Athletics releases NEW LOGOS!